From acclaimed director Guillermo Del Toro comes "a terrifying film of great elegance" (San Francisco Chronicle). Starring Academy Award© winner Mira Sorvino and screen favorite Charles S. Dutton and Josh Brolin this electrifying thriller brings the epic battle between man and nature to life when a team of scientists discover a glitch in their miracle cure. With the power to mimic and destroy its every predator and the threat of an entire city's destruction, their creation has taken on a horrifying life of its own. With the weight of extinction on their shoulders the team is forced to take matters into their own hands in this stylish hit that delivers heartpounding thrills from beginning to end. $7.818 million on 2255 screens. Director Guillermo Del Toro made his US debut with 1997’s Mimic. Across Manhattan, cockroaches spread a disease that kills off children. In an attempt to end this threat, Dr. Peter Mann (Jeremy Northam) recruits his wife Dr. Susan Tyler (Mira Sorvino) to develop a new breed of insect that will kill off these deadly roaches and save the children. This succeeds but it comes with unintended – and terrifying – consequences. Though the predatory bugs were supposed to die off after a single generation, they manage to survive and evolve. They manage to find a way to imitate humans and they set off a race to stop the killer bugs before they run rampant across New York. I suspect that the impact of Mimic will depend on one’s tolerance for insects. If they don’t provoke a reaction in you, then you’ll probably yawn throughout a lot of the film. But for folks who get the shivers when they see something slimy crawl around, the flick will present something different. That’d be me: as much as I recognize the natural need for insects, I can’t stand the things. Mimic capitalizes on that distaste with a tale that doesn’t usually collapse into “gross out” territory but manages to pour on the creeps. For a while, at least. Mimic works best in its first half, as that part of the flick tends toward subtle chills. As the tale progresses, Del Toro relies more on standard horror movie “boo” moments and the like. Some of these succeed, but they feel a bit cheap, especially after all the work that went into the atmospheric first half. Ironically, when the film tries more actively to scare us, it does less well. That first half plops us into spooky places and frightens us more due to what we don’t see than anything else. Once the terror becomes more obvious and overt, the movie fares less well. It also shows its roots more strongly. From the start, Mimic displays its clear connections to the Alien series, and those intensify as the tale progresses. While Mimic never feels like a rip-off, it occasionally follows the Alien blueprint a little more closely than I’d like. At least Del Toro keeps things creepy enough to keep our interest along the way. Can he turn a fairly cheap horror movie into a classic? No, and it’s a disappointment that the film “goes conventional” as it progresses. Still, it has enough creeps and scares to turn into a decent flick. Mimic appears in an aspect ratio of approximately 1.85:1 on this Blu-ray Disc. Though not without some minor discrepancies, the image satisfied. Sharpness mostly remained positive. A few wide shots displayed mild softness, but those instances didn’t crop up too frequently. The majority of the flick appeared detailed and distinctive. I saw no issues with jagged edges or moiré effects, and edge haloes weren’t a concern. As for print flaws, I noticed a few small specks bit nothing else. Effects shots could be rather grainy, though. In terms of colors, interiors tended to feature amber tones while exteriors opted for a blue tint. Within those parameters, the hues seemed fine; they never excelled, but they offered reasonable clarity. Blacks seemed deep and tight, and shadows were usually fine; the movie came with a lot of low-light shots and those could become rather dense, but they mostly seemed good. This was a positive presentation worth a “B”. I also felt pleased with the film’s moody DTS-HD MA 7.1 soundtrack. As expected, the mix went heavy with creepy atmosphere, and those elements added a good layer of spookiness. A few more active sequences materialized as well, such as those with trains or rainstorms. All of the elements combined into a neat package that placed us in the story’s settings. Audio quality worked nicely. Speech was natural and distinctive, without edginess or other issues. Music sounded lively and full, while effects appeared concise and accurate. Bass response showed solid depth and punch. I thought the movie provided a consistently involving soundtrack. The Blu-ray comes with a good roster of extras. We open with a Video Prologue from director Guillermo Del Toro. In this one-minute, five-second piece, Del Toro tells us a little about the Director’s Cut and its tough path to the screen. It’s mostly just a clip to welcome us, though, so it doesn’t tell us a lot. We hear from from the director via an audio commentary with Del Toro. He provides a running, screen-specific look at the project's origins and development, the opening credits, the adaptation of the source work and story/character topics, cinematography and visual design, themes, cast and performances, various effects, and conflicts/challenges during the production. That final subject becomes a pretty big subject here, though unfortunately, Del Toro can’t let loose and spill all the gory beans. He makes it clear that he went through a terrible experience in the creation of the film but feels he can’t dig into all the dirt. While it’s too bad we don’t get the “scorched earth” commentary Del Toro would clearly love to provide, he still delivers a pretty terrific chat. I don’t think I’ve ever heard a Del Toro commentary that was less than very good, and this one continues that trend. The director provides a ton of interesting facts and goes into detail about many of his experiences. Even without the warts and all, this becomes a fine piece. Three featurettes follow. 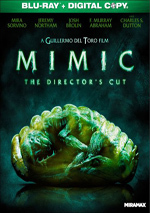 Reclaiming Mimic goes for 14 minutes, 31 seconds and delivers remarks from Del Toro as he discusses his thoughts about filmmaking and the horror/thriller genre as well as what he originally wanted to do with the movie and how his Director’s Cut helps restore his vision. Some of this appears in the commentary, but Del Toro expands on his thoughts in “Reclaiming” and makes this an honest, informative chat. A Leap in Evolution: The Creatures of Mimic runs nine minutes, 35 seconds and features Del Toro, creature designer Tyruben Ellingson, and creatures creator Rick Lazzarini. They talk about the design of the various fictional creatures and how the crew brought them to life. The participants provide a good overview of these technical topics. For the final featurette, we get the five-minute, 22-second Back Into the Tunnels – Shooting Mimic. 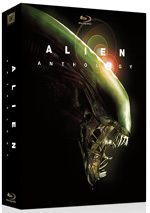 It includes notes from Del Toro and actors Josh Brolin, Charles S. Dutton, Mira Sorvino, and Jeremy Northam. They tell us a little about story/characters and aspects of the production, but mostly this is a short promo piece. Though we get a few decent insights, the program doesn’t tell us much. Three Deleted Scenes occupy a total of five minutes, 11 seconds. We find “Lunch at the Park” (2:30), “Kidnapped” (0:44) and “Alternate Ending” (1:57). “Park” provides a discussion between Peter and Susan about her potential pregnancy, while “Kidnapped” shows an abduction by a mimic. Finally, the “Ending” offers a change in a reunion that finishes the flick – and leaves open a little more room for a sequel. None of these are particularly good scenes; in particular, “Park” brings nothing new and just slows the tale. Storyboard Animatics accompany six scenes. These fill a total of six minutes, four seconds and show filmed storyboards accompanied by audio. They offer a fun way to check out planning materials. Finally, we locate a Gag Reel. It goes for two minutes, 20 seconds and shows a standard collection of goofs and giggles. Nothing especially interesting materializes. The disc opens with ads for the Scream trilogy, Lionsgate horror Blu-rays, Hostage and The Presence. These show up under Also From Lionsgate as well, and we get the film’s Trailer, too. A second disc provides a digital copy of Mimic. This lets you copy the flick onto a computer or portable viewing device. Is Mimic worth a look as anything more than an early work from Guillermo Del Toro? Yeah, to a degree; the film has some moments – especially in its first half – but doesn’t really gel into something satisfying. The Blu-ray offers pretty good picture and audio along with some useful supplements highlighted by an excellent commentary. The movie’s erratic but generally interesting.